The offense of the Los Angeles Chargers suffered a huge blow on Tuesday when Hunter Henry their tight end tore the ACL in his right knee during the team’s first day of organized training activities or OTAs. On Wednesday, Henry will receive a second opinion, but in all likelihood he will not play the entire 2018-19 NFL season. This would have been Henry’s third season and the Chargers were counting on him to develop into one of the key components of the Chargers offense, as the team decided not to bring back Antonio Gates, a future Hall of Famer, in free agency. Now the return of Gates is a big possibility, as San Diego is expected to re-consider signing the veteran, who is 37, said a source close to the team. The injury to Henry occurred early in team drills, and he was able to limp off the playing field under his own power. Once he was treated by team trainers, Henry stayed on the sideline for the remainder of Tuesday’s session. Following the session, San Diego head coach Anthony Lynn appeared to believe that Henry had not suffered any serious injury. Lynn said Henry was fine and the team only held the player out because they could. 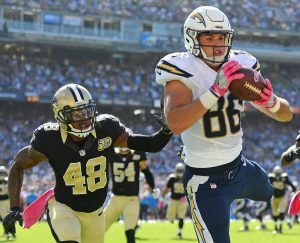 Henry, who is 23, took over as the main tight end of the Chargers in 2017, ending the season with 45 receptions, 579 yards receiving and four touchdowns. In games in which Henry was targeted five or more times the Chargers were 7-1 and in game he was targeted fewer than five times, San Diego was 0-6. Henry, who played his college football at Arkansas, has suffered various injuries in his first two seasons in the NFL. He lacerated a kidney in 2017 and missed the final two games of the season, and he missed a game with a knee injury his rookie season. General Manager Tom Telesco of the Chargers said during the NFL draft that the team had decided it would move on from Gates because targeting him on offense would be limited and they wanted to increase the role of Henry. However, Gates has a very good rapport with veteran signal caller Philip Rivers, knows San Diego’s offense intimately, and showed during the final two games of last season with 10 receptions, 137 receiving yards and one touchdown, that he is capable of still making plays. While the Chargers signed Virgil Green to be there blocking tight end and have three other players on the current 90-man roster at the tight end position, depth is a big issue.